Behold! Below is the result from putting two bananas and a pear through the Japanese-made manual juicer I found kicked to the curb Wednesday morning (and had so much trouble not only identifying but then juicing a solitary pear the first time around). I decided to give it another try this morning and I’m pleased to report the process went much better this second time around. Instead of more than five minutes to crush one piece of fruit I had the trio reformatted in less than 120 seconds. 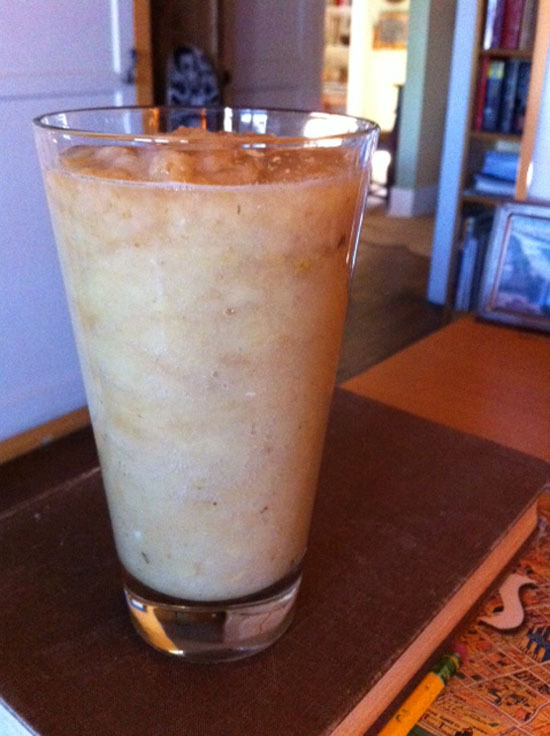 While my first hand-cranked pearnana smoothie might lack visual appeal, trust me on this: it was 非常においしい*. There so will be lemonade. * “very delicious” (at least according to Google Translate). This entry was posted on Friday, January 6th, 2012 at 9:05 am and is filed under DIY, food. You can follow any responses to this entry through the RSS 2.0 feed. Both comments and pings are currently closed.